Dizao Organics mascara is a true masterpiece when it comes to texture, it’s easily applied, long-lasting and effortlessly removed. Carnauba wax extract enhances the natural volume without clumps and stickiness, achieving the perfect eyelashes. 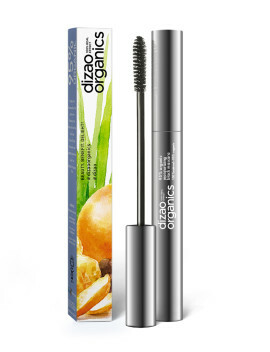 Dizao Organics mascara consists of 100% organic natural ingredients. - Тhe power of rice bran for protection, nourishment and replenishment of eyelashes. Bran extract creates a protective barrier, whilst enriching eyelashes with nourishing proteins. - Organic coffee extract for the deep black color. Hypoallergenic components of the mascara don’t cause any eye irritation and are suitable even for the most sensitive skin! Mascara consists of 100% natural ingredients, 95% of which are organic ingredients certified by USDA. Ingredients: Agua (Water), Organic Matricaria Recutita (Chamomile) Hydrosol, Organic Cera Alba (Beeswax), Organic Copernicia Cerifera (Carnauba Wax), Organic Coffea Arabica (Coffee) Powder, Organic Oryza Sativa (Rice) Extract, Organic Helianthus Annuus (Sunflower) Seed Oil, Organic Zea Mays (Corn Starch), Shellac, Organic Citrus Medica Limonum (Lemon) Peel Extract, Citrus Grandis (Organic Grapefruit) Seed Extract. 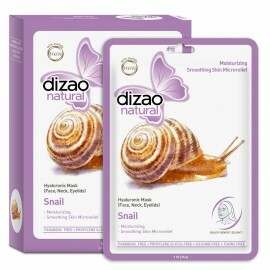 Dizao Natural masks contain 99,6% of natural ingredients, and their effect is comparable with a visit to a beauty salon. Classic Series masks include two stages: face or eye mask and Hyaluronic Cream, moisturizing the skin and boosting the masks effects. As a result, the skin looks fresh, strong and young. Directions: Put the mask on carefully cleansed skin for 15 minutes. Then remove the mask and rinse your face with water. For best result apply daily during 12 days, then 1-2 times a week. Intensively moisturize the skin and increase its resilience. Directions: After using the mask, apply a light, even layer of ceramides, leave on your skin until fully absorbed. 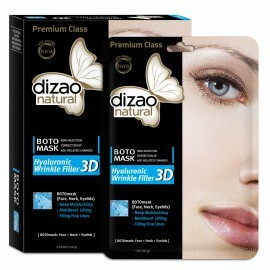 What are the benefits of Dizao Masks? 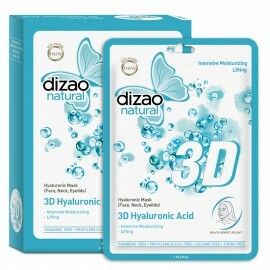 • All Dizao masks contain botanical collagen and botanical hyaluronic acid. Each box contains 10 masks. Made in CPR. 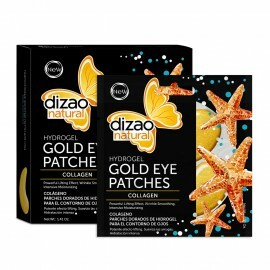 Dizao Natural Eye Patches contain 100% of Collagen, and their effect is comparable with a visit to a beauty salon. Hydrogel Texture of the Patch firmly adheres to skin so that you can go about your business during application. Melting body of the Patch releases the active ingredients gradually for better adoption by the skin. How do Dizao patches work? Marine Collagen is easily absorbed by skin. It firms the skin, prevents it from sagging and formation of wrinkles. As a result your skin looks lifted and smoothed, dark eye circles are remarkably reduced. How to use Dizao Patches? Put the Patches on carefully cleansed skin under your eyes for 20-30 minutes. Then you can use it immediately on other areas: forehead, smile or frown lines. After removal rinse your face with water. It is recommended to apply patches 2-3 times a week. • Contain 100% of Marine Collagen, which is easily absorbed by skin. • Firms the skin, prevents the skin sagging & formation of the wrinkles. • Remarkably reduces dark eye circles. • Skin looks lifted and smoothed. • No parabens, no propylene glycol, no petrochemicals, no GMO. 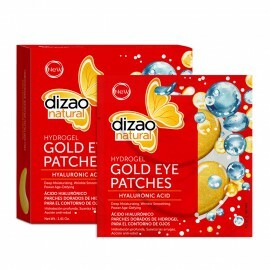 Dizao Natural Eye Patches contain 100% of Hyaluronic Acid, and their effect is comparable with a visit to a beauty salon. Hydrogel Texture of the Patch firmly adheres to skin so that you can go about your business during application. Melting body of the Patch releases the active ingredients gradually for better adoption by the skin. Ideal for skin moisturizing. Hyaluronic acid moisturizes the skin deeply, and helps to keep moisture for a long time. As a result the wrinkles are smoothed, your skin becomes firm and supple, dark eye circles are remarkably reduced. • Contain 100% of Hyaluronic Acid, which moisturizes skin deeply and helps to keep moisture for a long time. • Skin becomes firm and supple. • Smoothes out the wrinkles. 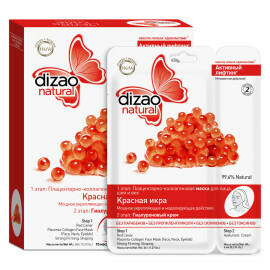 All Dizao Masks are consist of 99,6% natural ingredients and their effect is comparable to visiting of beauty salon. Three types of hyaluronic acid, included in the formula of the mask, are of different sizes and are perfectly absorbed by skin. Molecules of low-molecular hyaluronic acid are the smallest, so that they can be easily absorbed by skin, creating an inner moisture reserve; middle molecular weight hyaluronic acid locks moisture in epidermis, reducing depth of wrinkles; and high-molecular hyaluronic acid is able to hold a lot of molecules of water and protect the skin from moisture loss. Marine collagen of the mask boosts collagen formation. Skin collagen is a protein of youth which provides elasticity and long-lasting lifting effect. As a result, skin looks fresh, well-moisturized and full of energy. HYALURONIC CONCENTRAT (3 TYPES OF HYALURONIC ACID), MARINE COLLAGEN, HYDROLYZED COLLAGEN, ALGAE EXTRACT, VITAMINS: B, С, Е. Put the mask on carefully cleansed skin for 15 minutes. Then remove the mask and rinse your face with water. For best result apply daily during 5 days, then 1-2 times a week. • Hyaluronic Concentrat (3 types of Hyaluronic Acid), marine collagen, hydrolyzed collagen, algae extract, vitamins: B, С, Е. All Dizao Masks are consist of 99,6% natural ingredients and their effect is comparable to visiting of beauty salon. Boto Masks is non – injectional correction of age changes of skin. The rejuvenating peptide complex acts as a professional beautician and has a wonderful rejuvenating effect on skin. Acting like beauty injections, the myorelaxing peptide complex relieves muscle microtension and smoothes fine lines. The ingredients of the mask, in combination with Hyaluronic Concentrate, fill skin with revitalizing energy and strengthen its natural defense mechanism, promote removal of the oxidation products and boost collagen and elastin formation, make skin elastic and face contours lifted. As a result, age pigmentation is reduced; skin gets the glow of youth, which lasts for a long time. REJUVENATING PEPTIDE COMPLEX, HYALURONIC CONCENTRATE (3 TYPES OF HYALURONIC ACID), MYORELAXING PEPTIDE COMPLEX, MARINE COLLAGEN, ALOE, GINKCO BILOBA, VITAMINS: B, С, Е.
Snail Extract has wonderful moisturizing, smoothing and regenerating properties and facilitates recovery of skin elasticity. The mask creates a thin film on the skin to hydrate the skin and to lock its natural moisture inside for a long time. The mask has toning and anti-aging effects, restores complexion and the healthy glow of skin. Synergism of the masks` components has the unique ability to remove skin roughness, evening skin microrelief and making skin smooth and radiant. SNAIL SECRETION FILTRATE, HYALURONIC CONCENTRAT (3 TYPES OF HYALURONIC ACID), MARINE COLLAGEN, GINGKO BILOBA EXTRACT, VITAMINS: B, С, Е. • Active components: snail secretion filtrate, Hyaluronic Concentrat (3 types of Hyaluronic Acid), marine collagen, gingko biloba extract, vitamins: B, С, Е. The formula of 3D Hyaluronic Filler is based on three types of Hyaluronic Acid which penetrate deeply into the different skin layers and provide multilevel lifting. Acting like beauty injections, peptide complex of the mask reduces muscle micro tension, pushes wrinkles from inside out, makes skin look plump. As a result, the skin surface becomes smooth. The complex of active components, in combination with Hyaluronic Concentrat, intensively moisturizes skin, activates the process of skin regeneration and collagen formation, improves cellular metabolism in the skin. HYALURONIC CONCENTRATE (3 TYPES OF HYALURONIC ACID), MYORELAXING PEPTIDE COMPLEX, MARINE COLLAGEN, GINGKO BILOBA, VITAMINS: B, C, E.
Three types of collagen contained in the mask act at different layers of skin. It provides for firming and face contour shaping. Myorelaxing peptide complex relieves muscle microtension and smoothes fine lines. Active components of the mask in combination with Hualuronic Concentrate moisturize and smooth skin, promotes formation of collagen and elastin, provide the skin with vitamins and minerals, and neutralize free radicals, protect the skin from stress. As a result the face contour is shaped, wrinkles are smoothed and the skin looks fresh and firm. MARINE COLLAGEN, PLANT COLLAGEN, HYDROLYZED COLLAGEN, HYALURONIC CONCENTRAT (3 TYPES OF HYALURONIC ACID), MYORELAXING PEPTIDE COMPLEX, BAMBOO EXTRACT, ALGAE EXTRACT, VITAMINS: B, С, Е.